Make Fried rice right from your kitchen in the next few minutes? Wondering how to cook Fried rice or simply put, how to prepare Fried rice? Get in here for Fried rice recipes step by step guide. Fried rice is a dish of cooked rice that has been stir-fried in a wok or a frying pan and is usually mixed with other ingredients such as eggs, vegetables, seafood, or meat. It is often eaten by itself or as an accompaniment to another dish. 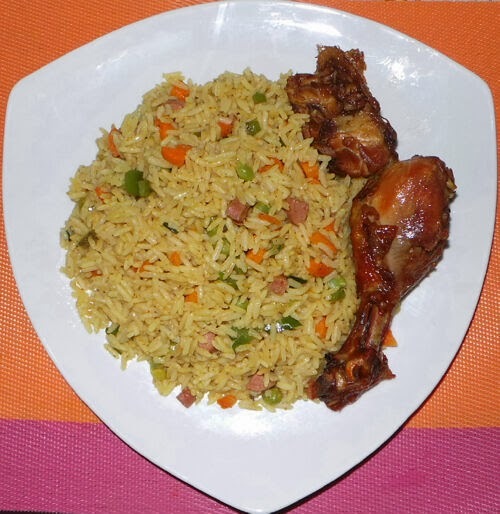 Nigerian Fried Rice is a rice dish that has a continental taste and look. This Nigerian rice meal is a party favourite. Chop up the vegetables and sausages and set aside. Parboil the rice and set aside. Season the meat, also with Curry, Salt, and Ginger and ground pepper. Cut the onions and garlic and add to the meat. Steam the meat on low heat till it brings out its own stock. When the meat is almost done, add some water and adjust the seasoning to your taste. Let it cook a little more. Make sure you have enough stock to finish cooking the rice. When the meat is done, strain it from the stock and fry or bake. Return the stock to the stove and bring to a boil. Pour in the parboiled rice into the chicken stock. Cook till the rice is done and water is fully dried. Add a little oil to a big pot and fry the hotdogs for 2minutes, then add the carrots and fry for another 2 minutes, then add the other veggies and fry for 1 minute. Season with knorr, curry and some salt. Add the cooked rice to the veggies and mix well. Enjoy with a big piece of chicken or turkey .